I’ve been following a discussion online about school Acceptable Use Policies for using computers. AUPs are documents that many schools get students to sign which outline the rules for using the computers. Students – sometimes quite young students – then have to sign it like a contract, a sort of in-writing promise that they won’t do the wrong thing; visit banned websites, try to hack the system, abuse the equipment, etc . 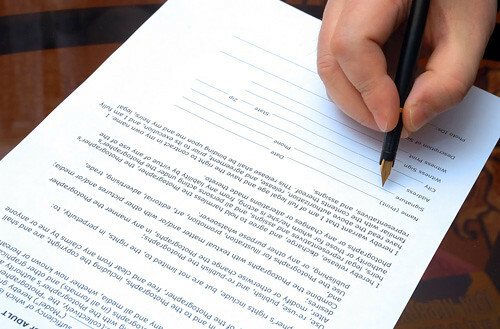 The contracts are usually enforced by people who rarely read the Terms of Service on the websites they visit themselves. There are lots of rules and expectations in schools that kids “just know” because it’s just part of the ‎culture and “the way we do things around here”. Most of those don’t need to be enshrined in some ‎sort of unenforceable contract.‎ Computer Use AUPs are about as effective as Lineup Neatly in the Cafeteria AUPs, Do Your ‎Homework AUPs and Keep Your Shoelaces Tied AUPs. There are rules, customs and expectations ‎about all these things, but we don’t seem to feel the need to have a contract for all of them. Why is Using A Computer so different.? Playing Lawyer by Chris Betcher is licensed under a Creative Commons Attribution-ShareAlike 4.0 International License. Yes- now I’m thinking. We get parents to sign something saying it’s OK for their kids images and work to be public on the net. At the same time we get the kids to promise to be good and not waste paper printing out rubbish. We used to ask parents if it was OK for their kids to use the internet. We don’t any more- it’s what we do around here. In many schools, I think enforcement of the AUP has moved on. I would argue, though, that the AUP actually can be more than just a flag to fan offenders with. 1. We still need a signed AUP. Schools must limit their legal (and financial) liability. This necessitates a reasonable, enforced AUP addressing a long list of specific scenarios, to be acknowledged by both students and their guardians. We are not recording voluntary consent, but rather awareness of the school’s policy. (Minter-Ellison 1997 Communication/Network Use Policy). 2. We must also teach the AUP. Schools aim to socialise students into generally accepted behaviour. As Chris said, this extends to undocumented customs and expectations. It should include well-informed, values-based judgements about observance of AUPs and TOS. Signing a non-optional AUP may have little impact on student culture, but the AUP introduces many community expectations which can be non-obvious or counter-intuitive to many students. 3. We must enact our values in our AUP. Schools exercise discretion in response to undesirable behaviour and incidents, taking into account the educational consequences, especially where the leaders have been thinking about restorative practices replacing more rigid rule enforcement. It is that nuancing that conveys the distinctive culture of the school, and models appropriate use of institutional power. An AUP can be written to express the connection between behaviour and values, not just rules and punishments. A good point you make Chris. I’ve just returned home from our Year 9 parent meeting where DER laptops (NSW Govt school program) were issued. Being a government school, the paperwork is all there, I’s dotted, T’s crossed. But getting the opportunity to speak to parents was an integral part of our process. One of the main points I wanted to make to the students and parents was that inappropriate behaviour with the laptop was no different to any other inappropriate behaviour. Defiance was still defiance. Normal classroom rules still apply. With a consistent message I’m hoping we can make this way of thinking part of the school culture – “the way we do things around here”. And that we’ll not need to refer to the signed User Charter too often. Of course, to establish an AUP is only as effective as part of a holistic approach to digital literacy; parent and teacher modelling appropriate behaviours around computer use, cyber bullying responding and reporting, creative commons and copyright, inappropriate content, how to search, spot hoaxes and stop spam. Some AUPs include all the above, others cite minimum computer skills *parents* are expected to have to effectively monitor the childens’ usage, others go further and suggest appropriate locations and times for use (family areas, wifi off after 9pm, central charging stations so mobile and netbooks are not in the bedroom after hours). It’s not that ‘it’s just the way that things are done around here’ it’s that technology is allowing communication and interactions to occur in times, places and with speeds that many have never experienced before… do you remember your first SMS, fax, email, skype, video-call? Was it 2am in your bedroom when you received it? I don’t think so. The problem new technology brings, is that there’s no precedent here of what is good behaviour. I don’t have a problem in documenting it when someone has a bit of foresight about what is possible. We didn’t have our own personal fax machine (or wifi) in the bedroom all those years ago, and now with our mobiles and netbooks we do, are we are supposed to limit our behaviour to that which was Acceptable Use when we only had limited technology? They’re all computers at the end of the day, so I don’t think it does harken back to the days before the digitally native; I draw closer parallels between reading an Andy Griffiths book and gaining an understanding of what I’m not meant to do, without ever going there.